The conceptual art world of the 20th century produced a number of revolutionary movements that exploded like fireworks, then faded equally rapidly. One of the more engaging of these movements is memorialized in an elegant museum in a quiet suburb of Amsterdam. 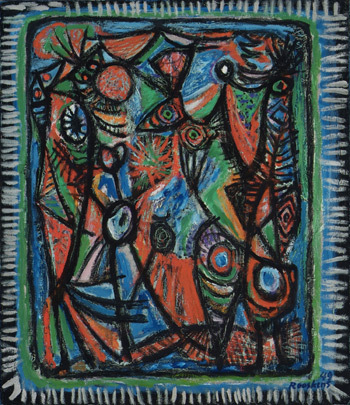 Corneille, Fête Nocturne (1950), collection of the Cobra Museum, Amsterdam. After World War II, the conservatism of northern Europe prompted many radical young artists to leave their homes in search of a more progressive environment. A number of these young artists met each other in Paris, Europe's artistic capital, and in November, 1948, formally pledged their allegiance to a new movement. This was christened CoBrA, from the capitals of the three countries represented most prominently - COpenhagen, BRussels, Amsterdam. This name was chosen from among several candidates suggested by the Belgian poet Christian Dotremont (his other proposals included Isabelle, as he noted, "for rather personal reasons"). The selection of Cobra was influenced by the recent coinage of Benelux to signal the cooperation among Belgium, the Netherlands, and Luxembourg. Like Surrealism before it, Cobra was a loose alliance of writers and painters. Cobra's artists did not share a common style, but rather a desire to create a radical new art that would use simple forms to produce universal symbols. As a reaction against the destruction of World War II and the stifling atmosphere of their home countries, Cobra privileged the iconoclastic, immediate, spontaneous, and primitive. A central goal was to use spontaneity to transform traditional folk art into a new kind of advanced art, accessible to all. Cobra has had its most lasting impact in the Netherlands. The leading Dutch Cobra painters were Karel Appel, Constant (Constant Anton Niewenhuys), Corneille (Cornelis van Beverloo), and Theo Wolvekamp. Other major figures in the movement included Asger Jorn, from Denmark, and Pierre Alechinsky, from Belgium. In a manifesto for the Dutch Cobra, Constant condemned Surrealism for its intellectualism, and denounced abstraction as sterile. 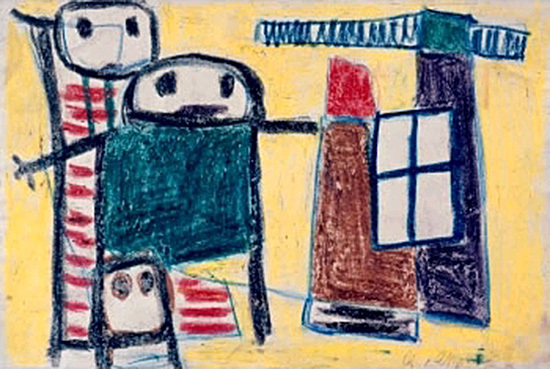 In contrast, Cobra wanted to create a new folk art based on expression, spontaneity, and the subconscious. The Dutch Cobra painters took their inspiration from the drawing of children, Surrealism, and the art of Miró, Picasso, Kandinsky, Klee, and Dubuffet. Anton Rooskens, Composite with Amphibian Figures (1948), collection of the Cobra Museum, Amsterdam. The greatest of the Dutch Cobras was Karel Appel. Some of the Cobra painters fully embraced abstraction, but during the Cobra years Appel did not. Done in his late 20s, Appel's Cobra paintings show us an imaginary world, with childlike figures made from bold blocks of bright colors. Appel's paintings of the late '40s and early '50s are like those of a child - the most inspired child artist who ever lived. They feature friendly ghosts, dragons, and other spirits, suspended in space with their oversized pets. 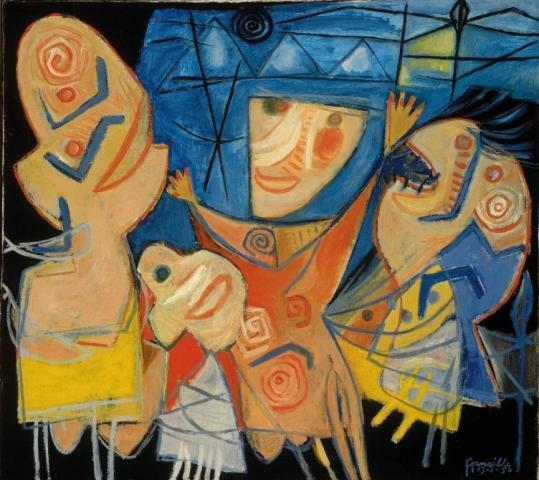 Appel loved jazz, and he aimed to give his paintings the energy and exuberance of bebop. There are moments in the history of art when an artist's unique vision is perfectly complemented by an innovative technical means of expression, and the result is magical. Appel's Cobra period is one of these wonderful moments. 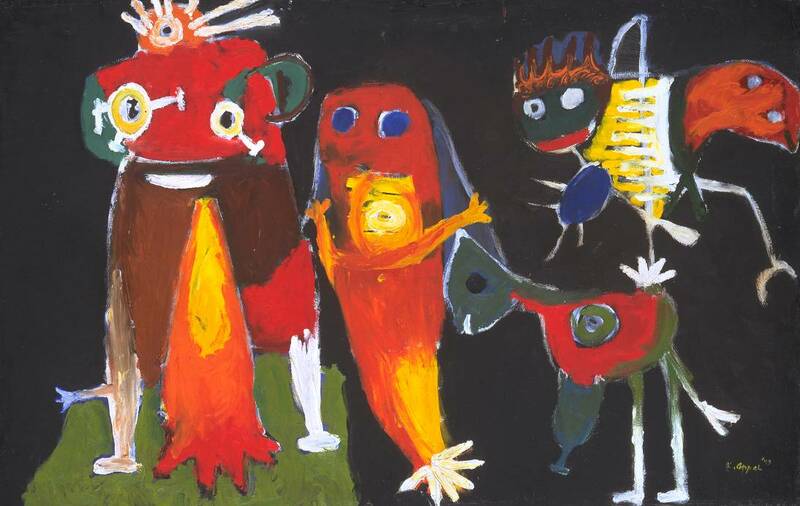 Karel Appel, Questioning Children (1948), collection of the Cobra Museum, Amsterdam. Cobra functioned as a group only for a few years: it was dissolved in 1951, as its young radicals discovered their own voices and went off to pursue their own goals. Yet because it was a highly conceptual movement, many of these young artists - including Appel - had already reached the peak of their development by the time the group disbanded. Cobra's life had been short but intense. 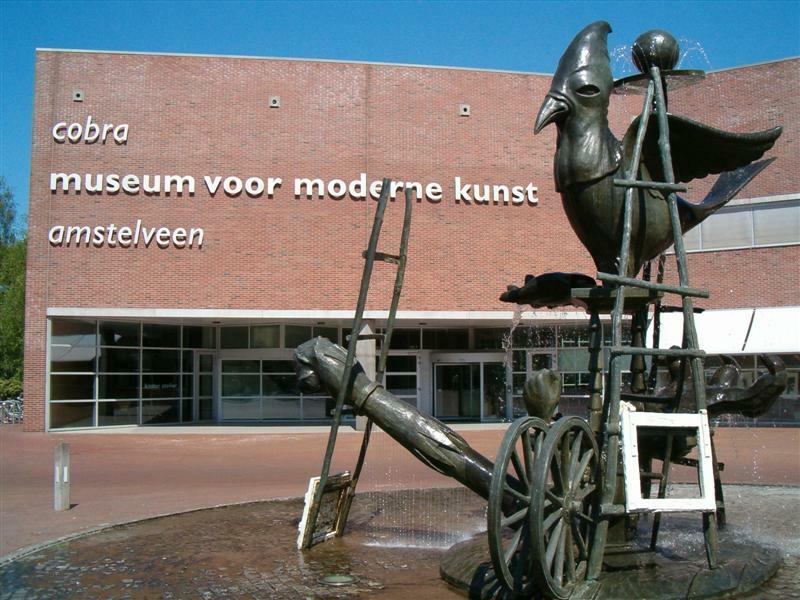 The Cobra Museum was founded in 1995, to increase appreciation for innovative movements in Dutch modern art. Cobra was arguably one of two significant Dutch movements in 20th-century art, and it is generally overshadowed by its predecessor, De Stijl. But the excitement and freedom of Cobra stand in sharp contrast to the austerity and rigidity of De Stijl. Karel Appel, Hip, Hip, Hoorah! (1949), collection of the Tate Modern, London. The Cobra Museum is in Amstelveen, a prosperous suburb of Amsterdam. It is easily reached by taking the southbound tram number 5 from central Amsterdam to its final stop, Amstelveen Binnenhof (30 minutes from downtown Amsterdam), then walking all the way through a huge shopping mall to its far southern end. In front of the museum, a large fountain by Karel Appel, resembling a supersized Rauschenberg combine, featuring a giant rooster, spouts water onto the surrounding cobblestones. The Cobra Museum. Image courtesy of Wikimedia Commons. The museum itself is a sleek, modern building built into a picturesque canal. In the canal, ducks paddle past a suspended Corneille sculpture of a flying cat, oblivious to his menacing pounce. The Cobra Museum is unfortunately well off the beaten path for tourists: there are rarely more than a few dozen visitors in the spacious building, and the entries in the guest book are mostly in Dutch (though one recent visitor wrote in French that it's a pity the museum isn't better known). If you're in Amsterdam, go to the museum to see beautiful modern art in a peaceful setting, as a change of pace from the crowds of the great Amsterdam museums.